When the winning horse crosses the line at Ascot, it’s not because it has had a better breakfast or a magic saddle or even a genius rider. The winning horse has simply run faster and put more work in. Similarly, high-performing salespeople know that winning is not down to accident or luck but is a matter of putting the work in through relentless prospecting. They realise that the prime cause of poor sales is an empty pipeline and that the prime cause of an empty pipeline is a persistent failure (or unwillingness) to prospect. In our experience of coaching telephone sales teams, the underperformers usually blame their list, or a client’s unwillingness to engage, and generally find every reason not to cold call or prospect. In contrast, star performers carefully navigate target organisations, doggedly dial to get through to decision-makers and then thoroughly qualify those prospects. It is no coincidence that the top prospectors are also highly organised, structure their call blocks effectively and track their numbers systematically. In his book ‘Start Now, Get Perfect Later’, Rob Moore alludes to what he calls ‘IGA’s’ (Income Generating Activities) as being the most important things a high-performer needs to concentrate on. Yet, it is amazing how many telephone salespeople seem to let other things get in the way of lifting the phone and dialling. 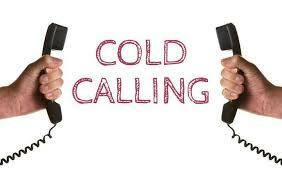 We help cold callers to focus on the one activity which generates pipeline and that is the execution of planned call blocks which get them through to decision-makers. Take any golfer, tennis player or athlete – all professional sports people know their numbers, whether volleys, serves, swings or free kicks. In much the same way, the most effective telephone salespeople know their numbers. Let’s assume that tracking productivity for a while reveals that it takes a salesperson (on average) 247 dials to get 29 conversations with decision-makers, to get 5 face-to-face meetings, to get a single sale. This is therefore the formula for effort which needs to be applied consistently. We help professionals to understand and leverage their numbers. Time and time again, we encounter telephone salespeople who have been trained to ‘get past the gatekeeper’. Most overlook that gatekeepers are people, and that sales is a people business. We are in the people business. The person we are most likely to speak to is a person who is often at the hub of an organisation and has the power to put us through or close us out. The gatekeeper is called the gatekeeper for a very good reason. We show high-performers how to work with people and sell through them, not get past them. The predominant reason given to explain poor performance on the telephone is fear. Fear that the prospect is busy and will hang up. Fear that the prospect is the wrong person. Fear that the prospect has no interest. We explain that these fears and most reasons for not lifting the phone and dialling are FALSE. False Assumptions Let Sales Escape (FALSE). High-performers never assume that there is a perfect time to call, nor do they assume that the prospect is disinterested. The most important word in selling is ‘next’. We help top performing telephone salespeople keep on going.